Like I suspect most gamers who hit their gaming prime back in the 80's and early 90's, I read a lot of Fantasy and Science Fiction. I still do, but my patience and free time have cut that down by order of magnitude. During my summer breaks in my College years, it was not unheard of for me to read a full length novel in a day, sweating up a storm as I laid out on the same enclosed porch I am currently sitting in. When I wasn't reading, I was gaming. If I wasn't reading or gaming, I was probably writing. Truth to tell, my "Writer's Voice" back in those days pretty much mirrored the author(s) I was heavily reading at the time. Which isn't a bad exercise in writing, but it's a piss poor way to write anything of consequence. These days, the only author I follow with any regularity is Terry Pratchett; I simply can't get enough of his writing. I'll read Neil Gaiman's latest if I can grab it on my Kindle and I'll occasionally read some short fiction. Which isn't to say I hardly read, I just read less fiction these days. I'm quite sure that tide will turn again. It does mean that when I write Tales of the Blue Knight it is truly in my own "Writer's Voice". Forgive me as the voice falters and cracks, I haven't tried to use it much in years. It will take a few tries for it to find it's range. I've posted to my blog from my desktop, laptop, net book, iPhone and iPad, never really given much thought to the device I was using. That is, until I started with the Tales of the Blue Knight column. I've found that I have ideas that need to be put down without being fleshed out at the moment. I also need to be able to access those pieces from any device. Therein lies the joys and strength of Google Documents, cloud computing at it's best. A free office app that is accessible anywhere you have Internet access? Priceless! I've got a virtual stack of PDFs to review, even if it is just to give it a quick once over. 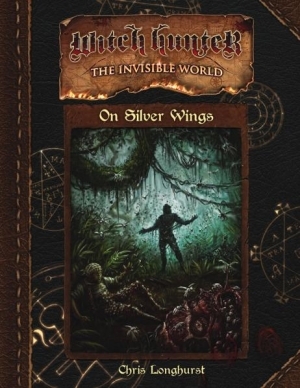 Sean over at OneBookShelf / RPGNow / DriveThruRPG was nice enough to set me up as a featured reviewer, and while I'm going to try and do the privilege justice, I'm sure to overlook a lot of stuff. I did get to skim through some recent acquisitions while serving Jury Duty these past two days, but the free time was no where near as I remembered in the past. I do have vacation coming up at the end of the month, and I suspect that with the exception of the holiday weekend it will be a Stay at Home vacation... so much reading, writing and posting will fill the downtime. It is a very compelling story, which read very well even without me having a grasp of the system underneath it. It's hard to go into without giving up some of the story (and this adventure would suffer if the story were leaked). It is deep in roleplay with a nice horror angle to it and little is as it seems... if bugs make your players squirm this is a good fit. Most of the paths the party may take seem to be covered pretty well. The Witch Hunters should have their hands full, but smart play should rule the day for them. I highly suspect a decent GM could convert this to run with the Solomon Kane RPG without too much effort. Overall it served me well during my two days of Jury Duty. When time frees up I may have to pick up the rulebook itself. The system seems to be full of roleplay opportunities. Waiting on the lawyers to arrive so they can get back to questioning more of us prospective jurors. Even got feedback on yesterday's Traveller freebie on Facebook. There is something about Traveller that makes it THE classic game. My problem with it was the lack of character advancement. I need to dig up my copy of the Mongoose Traveller pocket rules and see if that changed. Advancement is a big carrot in the "keep player's coming back" scheme of things. Time willing I'll work on the next entry of Tales of the Blue Knight while I kill time. Spent the day at jury duty, heading out to a retirement party in a few, then back to jury duty tomorrow. So today's offering is just a single item. It's a cool one tho'. 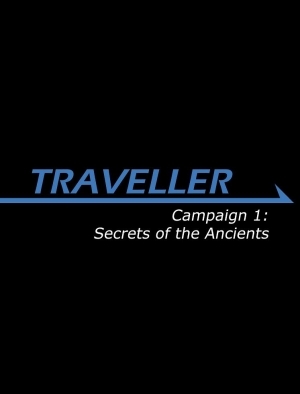 Campaign 1: Secrets of the Ancients for Traveller from Mongoose. Secrets of the Ancients is a ten part campaign, with a new part being available for free download every few weeks (if you play once a week and start right now, you should find that a new part comes available just as you are completing the last). It will build into an epic campaign of huge proportions which should keep your gaming group going for many months! A free campaign for Traveller with a new part released every few weeks. What Traveller fan could ask for more? The last time I served jury duty was over 8 years ago. The jurors waiting room was hot and sweaty, the chairs were uncomfortable and the entire experience was a real PITA. Today the A/C is kicking to the point I am tempted to put my jacket on, the chairs are large and comfy, free high speed Internet for your laptop or iPad (and computers for you to use if you didn't bring your own), widescreen TVs... This is not the Jury Duty that I remember. With New York States no-excusal police, I can't help but think how much fun it would be to have a superhero serve jury duty ( in his secret ID) for a villain he arrested / apprehended. Might make a decent solo supers adventure of sorts. Not that I play supers (I do have the Icons PDF and it is tempting) but I do find the concept interesting. Anyhow, we've already been told we will be here until 5 pm. Gonna be a long day even with distractions to be found. I report to Jury Duty tomorrow. Boo! I'm currently trying to figure out a method (or methods) for giving out the free (with a coupon code) PDFs that OneBookShelf has been kind enough to give me to reward the readers of this blog. Leaning towards rewarding my Google Connect Followers with a prize or two for a random follower, but I'm open to other ideas. I'm on telephone standby jury duty. New York State doesn't have blanket excusals from jury duty these days for certain professions, and my number literally is up. Tenkar peered through the spyglass at the dimly lit street below. He kept his body bladed, so that the window curtain would partially obscure his presence from the curious. The room next to him was filled with the noise of young romance, but that was little if any distraction. "Male Hobbit" he signed with his right hand. Most of the buyers would take the clack with their right hand and hold onto it for dear life. Others would push it deep in a pocket, possibly ashamed of their addiction. His message was read by the two uniformed watchmen below. They casually yet quickly made their way within view of the buyer. They would follow him for a block or two before making the pinch. Even at this late hour of night, there was enough foot traffic to make the sight of them fairly common. That's the sixth buyer we picked of tonight. Will the Sarge give us the order to grab the dealer, or is this going to be just another exercise in numbers for the Watch Commander to show the City Council? This precinct in the city had more then its share of crime, much of it driven by the pursuit of illegal narcotics. Many of the addicts committed petty crimes to fuel their addiction, and the dealers and suppliers frequently turned violent on their rivals. It took Tenkar some real effort to remember that over 90% of the population, while poor, was law abiding and generally good folk living in a bad situation. He grew up in this city, but not in a neighborhood like this. "Ten, give the signal. Grab the dealer. We have enough bodies pinched tonight to make this one stick." Tenkar's hands were still passing the words on as the sergeant went downstairs to oversee the ending of the night's operations. Hopefully the perps we pinched will allow the Cleric on staff to cure their addiction, but even then more then half will be right back. Apparently the Gods can only cure the body, not the mind. Clack - Highly addictive narcotic. Cheap to get started with. Save vs Poison with each use until failed save, at which point addiction sets in. Once addicted, the drug must be used daily. If unable to pay for the clack, character in question will steal / kill for clack / money for clack. Within 2 weeks of addiction, CHA and CON drops 1 point. It drops another point each following week, until a maximum loss of 8 points is reached. At this point, 1 HP is lost per week permanently. Upon reaching 1 HP left, save vs. poison each week or death. Yep, some more goodies to be found. This weeks weekend offerings only number 2, but we had some freebies mid week, and a 20% discount yesterday... besides, these two have a nice page count. This week's freebies are from Vajra Enterprises. Both are playable versions of their respective games, but they lack options available in the full product. Still, for a try and (possibly) but later, they are very good options to take a peek at. 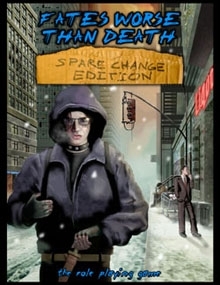 Fates Worse Than Death: Spare Change Edition - Fates Worse Than Death is a game of violence, fear and hope on the streets of New York City in 2080 - The Spare Change Edition only has character creation options and setting information for creating and playing characters who are street people. As usual, I find free products are ripe for ripping and stealing for other games even if I don't use them as printed. 241 pages. 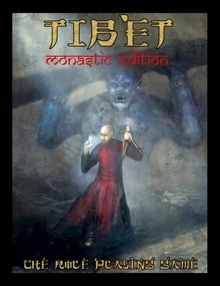 Tibet the Role Playing Game: Monastic Edition - Tibet is a game of war, intrigue, magic and mysticism in 1959 Tibet. The Monastic Edition only has character creation options and setting information for creating and playing characters who are monks. 169 pages. There is enough here to help you decide if the game is to your liking or not. Both are way more then a quickstart, yet less the a full package. That's all for now. Cranking away some other writing. Oh, and received my 5 copies of Dark Dungeons in paperback from Lulu. Little surprise for the seasonal gathering of my old gaming group.